Et Verbum: The Life Of Saint Monica By F.A. Forbes part. 8. The Life Of Saint Monica By F.A. Forbes part. 8. It was about this time that Augustine's enthusiasm for the Manicheans began to cool. He had been studying their doctrines, and had found that they were not quite what he thought. He was disappointed with their professors too. The first unpleasant truth that dawned upon him was that they were much better at denying the doctrines of the Catholic Church than at explaining their own. It was almost impossible to find out what they believed, so vague did they become when closely questioned. And Augustine questioned very closely indeed. He was on the track of truth, and it was not easy to put him off with hazy general statements. He was still only an "auditor," and before he took any further step he wanted to be certain of his ground. The men whom he consulted did not seem very certain of their own, he remarked, but they bade him have patience. One of their bishops, Faustus by name, was soon coming to Carthage. He was one of their most brilliant preachers, and would be able to answer all Augustine's questions. This sounded promising, and Augustine awaited his coming impatiently. He certainly was an eloquent speaker; his sermons were charming. But when Augustine went to him privately and explained his doubts to him, the result was not what he had hoped for. He gave the same vague answers that Augustine had so often heard already. Pressed closer, he frankly replied that he was not learned enough to be able to satisfy him. Augustine was pleased with his honesty, and they became good friends. But the seeker was no nearer the truth than before. Yet if Faustus could not answer him, which of the Manicheans could? He began to lose faith in them. What did the Catholic Church teach on these points? he asked. This was a question which they could all answer, and did—with great eagerness and little truth. It might have occurred to a less intelligent man than Augustine that the enemies of the Church were not the people to answer such a question fairly or truthfully: but he accepted their facts, and decided that truth was not to be found there either. Was there such a thing at all? was the final question he asked himself. The old philosophers, heathens as they were, seemed to get nearer to the heart of things than this. Yet now and again, out of the very sickness of his soul, a prayer would break out to that Christ Whom he had known and loved in his boyhood, but Who had grown so dim to him since the Manicheans had taught him that His Sacred Humanity was nothing but a shadow. He was weary of life, weary even of pleasure, weary of everything, weary most of all of Carthage. Owing to the wild ways of the students it was impossible to keep anything like order in the schools. Classes were constantly interrupted by gangs of "smashers," who might break in at any moment, setting the whole place in an uproar. Augustine's friends pressed him to go to Rome. There, they urged, he would meet with the honour that he deserved. There the students were quieter and better-mannered; no rioting was allowed; scholars might enter no school but that of their own master. This sounded hopeful; Augustine was rather pleased with the idea. He wrote to Monica and to his patron Romanianus to tell them of the step he proposed to take. Monica's heart sank when she read the letter. To the Christians of the fourth century Rome was another Babylon. She had poured out the blood of the saints like water; she was the home of every abomination. What would become of Augustine in Rome? Without faith, without ideals, a disabled ship, drifting with every wind. He must not go, she decided, or if he did she would go with him. She prayed that she might be able to make him give up the project, and wrote strongly against it; but Augustine had already made up his mind. Then, in despair, she set out for Carthage to make one last effort. Her son was touched by her grief and her entreaties, but his plans were made: he was to start that very night. "I lied to my mother," he says, "and such a mother!" He assured her that he was not going, that she might set her mind at rest. A friend of his was leaving Carthage, and he had promised to go down to the harbour to see him off. Some instinct warned Monica that he was deceiving her. "I will go with you," she said. This was very awkward for her son; he was at his wit's end to know what to do. They went down to the harbour together, where they found Augustine's friend. No ship could put out that night, the sailors said, the wind was dead against them. The young men were unwilling to leave the harbour in case the wind should change and they should miss the boat, while Monica was determined not to leave Augustine. They walked up and down together on the seashore in the cool evening air. The hours passed, and the situation became more and more difficult for Augustine. What was he to do? Monica was weary and worn out with grief. An idea suggested itself to him suddenly. It was no use waiting any longer, he said, it would be better to take some rest; the boat would certainly not start that night. Monica was in no mood to rest; but Augustine knew her love of prayer. There was a little chapel on the seashore, dedicated to St. Cyprian. Would she not at least go there and take shelter until the morning? He promised her again that he would not leave Carthage, and she at last consented, for her soul was full of sorrow. Kneeling there in the stillness of the little chapel, she poured out the troubles of her heart to God, beseeching Him that He would not let Augustine leave her. The answer seemed a strange one. As she prayed the wind suddenly changed; the sailors prepared to depart. Augustine and his friend went on board, and the ship set sail for Rome. The last thing they saw as the shore faded away in the dim grey of the morning was the little chapel of St. Cyprian lying like a speck in the distance, But they did not see a lonely figure that stood on the sand and stretched out piteous hands to Heaven, wailing for the son whom she had lost a second time. It was God alone Who knew all the bitterness of that mother's heart. It was God alone Who knew how, after the first uncontrollable outburst of grief, she bent herself in faith and love to endure the heartbreak—silent and uncomplaining. And it was only God Who knew that the parting that seemed so cruel was to lead to the granting of her life-long prayer, to be the first stage in her son's conversion. "She turned herself to Thee to pray for me," says Augustine, "and went about her accustomed affairs, and I arrived at Rome." It seemed, indeed, as if his arrival in Rome was destined to be the end of his earthly career, for soon afterwards he was attacked by a violent fever and lay at death's door. He was lodging in the house of a Manichean, for, although he no longer held with their doctrines, he had many friends among them in Carthage who had recommended him to some of their sect in Rome. Augustine himself was convinced that he owed his life at this time to his mother's prayers. God would not, for her sake, let him be cut off thus in all his sins, unbaptized and unrepentant, lest that mother's heart should be broken and her prayers unanswered. He recovered, and began to teach. Already while he was in Carthage he had suspected that the lives of the Manicheans were not much better than those of the heathens among whom they lived, although they gave out that their creed was the only one likely to reform human nature. In Rome his suspicions were confirmed. Thinking that Augustine was altogether one of themselves, they threw off the mask and showed themselves in their true colours. The pagans at least were honest. They professed openly that they lived for nothing but enjoyment, and in this great city, even more than in Carthage, one could learn how low a man might fall; but at least they were not hypocrites. He resolved to cut himself adrift from the Manicheans altogether. There was a Christian Rome within the pagan Rome, but of this Augustine knew nothing. On the Throne of the Fisherman sat St. Damasus, wise and holy. His secretary, St. Jerome, was already famous, no less for his eloquence than for the greatness of his character. Jerome, like Augustine, had been carried away in his youth by the downward tide, but had retrieved himself by a glorious penance. The descendants of the oldest Roman families were to be found in the hospitals tending the sick or working amongst the poor in the great city. The first monasteries were growing up, little centres of faith and prayer in the desert. They were peopled by men and women who had counted the world well lost for Christ, or by those who to save their souls had fled, as the great St. Benedict was to do later, from the corruptions that had dragged down so many into the abyss. 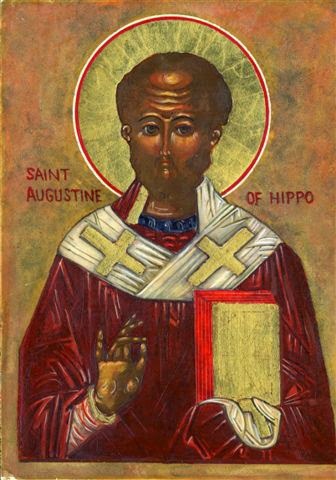 Augustine had been greatly attracted shortly before leaving Carthage by the preaching of Helpidius, a Catholic priest. The idea came to him while in Rome to go to the Catholics and find out what they really taught. But he dismissed it. The Manicheans had already told him, he reflected, that no intelligent man could accept their doctrines. Besides, they were too strict; their ideals were too high; he would have to give up too much. One more honest impulse was stifled. He entered a school of philosophers who professed to believe in nothing. It was, he decided, the wisest philosophy he knew.